MACRS stands for “Modified Accelerated Cost Recovery System.” It is the primary depreciation methods for claiming a tax deduction. Of course, like all things accounting, depreciation can be tricky and it’s impossible to remember all the intricate details. Click below to download our free ultimate guide to Macrs depreciation. If you’d like to learn about other depreciation methods or want to learn more about how depreciation works in general, read our What is Depreciation? article. When most people think of depreciation, they think of getting a tax deduction. MACRS is the primary depreciation method used for tax purposes. When you purchase an asset for business (such as equipment, software, or even buildings), you typically cannot write off the entire cost of the asset in the year of purchase. Rather, the IRS allows you to deduct only a portion of the cost each year over the number of years the asset is expected to last. For example, if you purchase a computer for $1500, you generally can’t deduct the entire $1500 in the same year that you purchase the computer. However, you are able to deduct a portion of the cost each year using the MACRS depreciation method. MACRS stands for Modified Accelerated Cost Recovery System because it allows you to take a larger tax deduction in the early years of an asset and less in later years. (Note: If you qualify for a Section 179 deduction like most businesses, you can deduct the full cost of assets, up to $500,000, in the year of purchase instead of using MACRS. Learn more about the Section 179 deduction here). Depreciation can also be reported for accounting purposes. Some businesses keep two sets of books–one for taxes and one for internal and external reporting–and depreciation may be calculated in different ways for taxes and for internal/external financials. While most small businesses aren’t required to report depreciation for their books, depreciation can help make sure your books accurately reflect your business income when you purchase expensive assets. For book depreciation, you cannot use MACRS. You must use another method described in our article, What is Depreciation, and How Does it Work? Pro Tip: Whether you use Macrs depreciation, straight line depreciation or some other method you will need to create and save a depreciation schedule for all fixed assets. QuickBooks Online makes this easy. You’ll have the schedule that you and your CPA need to make tax time a breeze. Click Here to get up to 50% off QuickBooks Online. When it comes to calculating depreciation, I recommend that you let your tax software or your tax professional do the calculations for you. However, it is still good for you to understand how the formula works. While the formula is simple, what makes calculating MACRS difficult, is that the depreciation rate used varies depending on the type of asset you are depreciating. Below is a snapshot of each table along with a brief description of how each of them is used in the calculation. Below the tables, we will discuss how to select the information from the tables that you will need to use in order to claim your tax deduction. We also walk you through a hypothetical example. GDS using 200% DB – An accelerated depreciation method that will give you a larger tax deduction in the early years of an asset (property). Refer to the above table for the types of property this method is primarily used for. GDS using 150% DB – An accelerated method of depreciation that will result in a larger tax deduction in the early years than in the later years of an asset. See the table above for the complete list of properties you would generally use this method for. GDS using SL – A depreciation method that provides for equal yearly deductions for nonresidential real property, residential rental property and several other property types listed in the table above. ADS using SL – A depreciation method that provides for equal annual deductions(except in the first and last years). Used primarily for tax-exempt property and property used outside of the U.S. Refer to the table (above) for the complete list. Using the MACRS Percentage Table Guide (above), you can determine which depreciation rate table (below) you will need to use. There are about 18 depreciation rate tables provided by the IRS. Below is a snapshot of just two of the tables. You can find a full list of the tables in IRS Pub 946, Appendix A. From this table you can get the depreciation rate allowed for each year of the asset’s useful life or recovery period. As I said before, we recommend that you let your tax software or your tax professional handle these depreciation calculations for you. A tax software, like TurboTax, will automatically calculate depreciation of fixed assets and will check for other deductions your business may be eligible for. You can get started for free and you only pay when you file. There are two types of depreciation systems that fall within the MACRS depreciation method: the General Depreciation System (GDS) and the Alternative Depreciation System (ADS). In general, most small businesses must use GDS unless you are required by law to use ADS. Listed property used 50% or less in a qualified business use. Any tangible property used predominantly outside the United States during the year. Any tax-exempt use property. Although your property may qualify for GDS, you can elect to use ADS. You can learn more about the requirements to make the ADS election in Pub 946. There are nine property classifications for MACRS GDS and ADS. 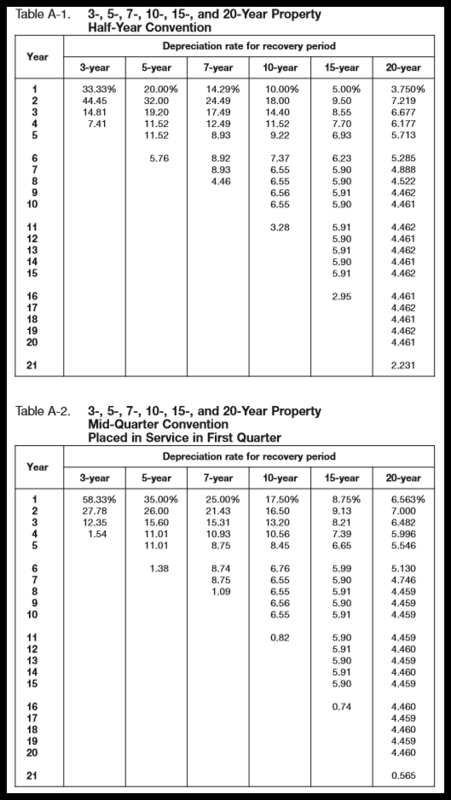 Below is a summary table of 3, 5, and 7 year property classes. You can find the full list in IRS Pub 946. The cost basis for an asset is any costs incurred so that you can start using it in your business. This includes but is not limited to sales tax, installation charges, delivery charges, and any other related costs. Purchase price of the asset – The amount you paid for the equipment, vehicle or other asset purchased. Sales tax – This is the amount you paid in sales tax (if any) for the asset. 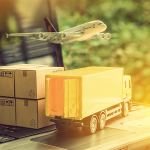 Shipping and delivery costs – Include shipping or delivery charges you paid to get the asset to your place of business. Installation charges – Any amount paid to install the equipment or furniture at your place of business. Other costs – Be sure to include any other expenses that you had to pay to make the asset usable for your business. For example, if you purchased a new machine and you had to have a technician come out and calibrate it before you could use it, the amount paid to the technician should be included in the cost basis of the machine. The convention establishes when the recovery period (useful life) of an asset begins and ends. The convention you use will determine the number of months you can claim a tax deduction in the year that you start using the property and in the year you stop using it. Mid-month – The mid-month convention assumes that you placed the property in service or stopped using it for your business in the middle of the month. This means that your tax deduction is limited to a half month of depreciation in the month the property was placed in service and in the month you stopped using the property for your business. This convention applies to nonresidential real property, residential real property, and any railroad grading or tunnel bore. If your property does not fall into one of these categories, then the mid-month convention does not apply. Mid-quarter – The mid-quarter convention assumes that you placed property into service or disposed of the property at the midpoint of that quarter. This means that your tax deduction is limited to 1 ½ months of depreciation for the property in the quarter that it was placed into service and in the quarter it is disposed of. The mid-quarter convention should only be used if the mid-month convention does not apply and the total depreciable bases of MACRS property placed in service or disposed during the last 3 months of the tax year are more than 40% of the total depreciable bases of all MACRS property you place in service during the entire year. This does not include nonresidential real property, real property, railroad grading or tunnel bore and property that is being depreciated under another depreciation method. If the mid-quarter convention does not apply, then you must use the half-year convention. Half-year – Use this convention if neither the mid-month convention nor the mid-quarter convention apply. The half-year convention treats all property as if it were placed in service or disposed of at the midpoint of the year. This means that your tax deduction is limited to 6 months in the year that you placed the property in service and the year that it is disposed of. There are 4 MACRS depreciation methods. Three of them fall under the GDS system, and the fourth method falls under the ADS system. If your property falls into any of the groups described above, you must use the ADS system. 200% declining balance method over a GDS recovery period – This method provides a larger deduction in the early years of an asset’s useful life and less in the later years. 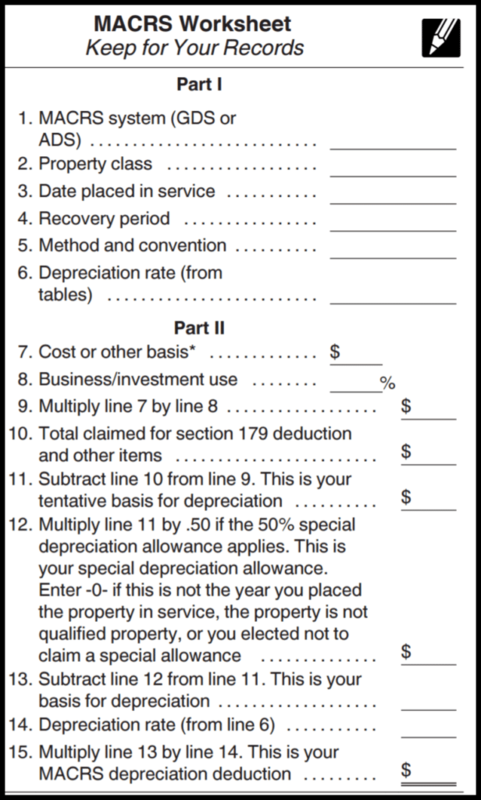 Refer to the MACRS Depreciation Methods table for the type of property to use this method for. 150% declining balance method over a GDS recovery period – Similar to the 200% declining balance method, it provides a larger deduction in the early years rather than the later years of an asset’s useful life. 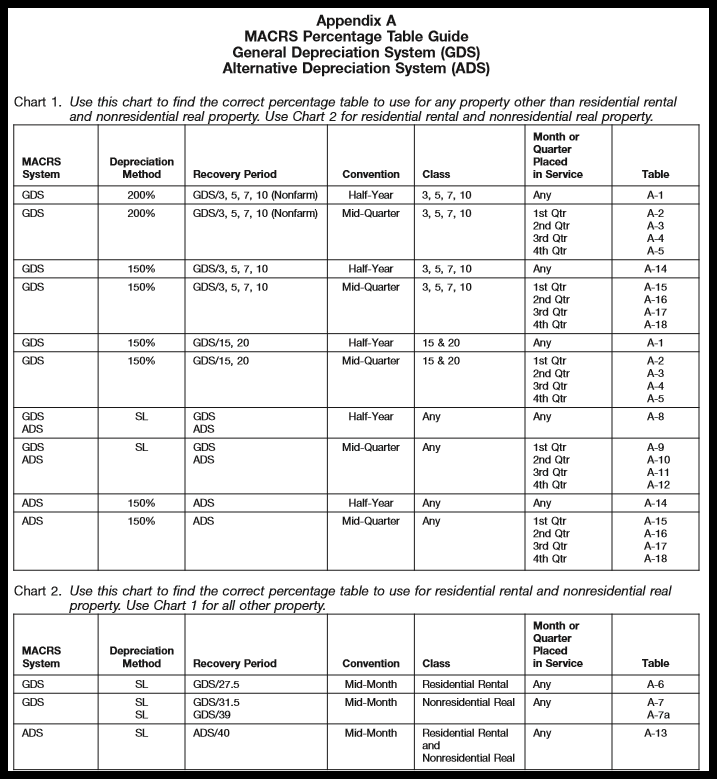 Refer to the MACRS Depreciation Methods table for the type of property this method applies to. Straight line method over a GDS recovery period – This method allows you to deduct the same amount of depreciation every year except the first and last year of service. 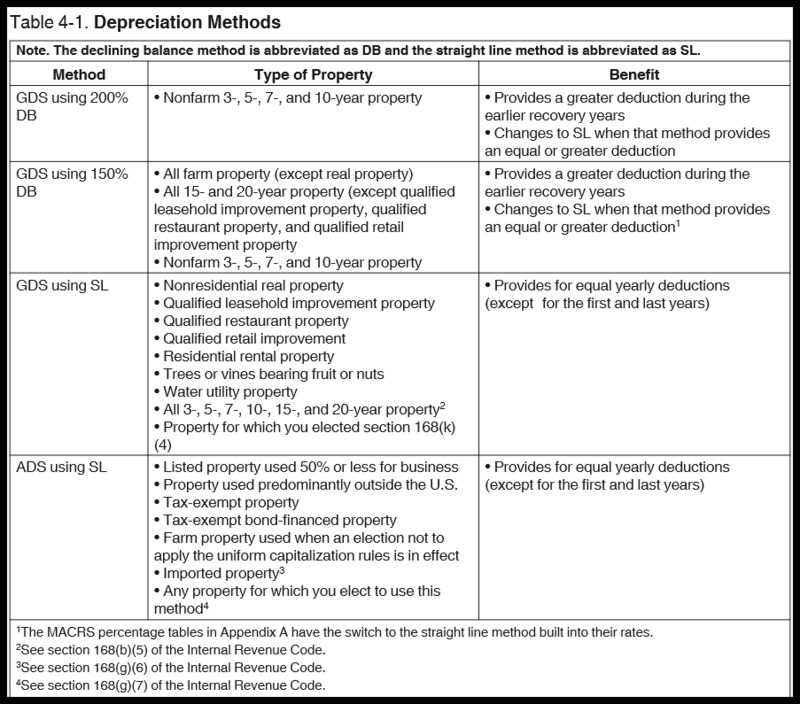 See the MACRS Depreciation Methods Table for a list of the property types that would use this method. Straight line method over an ADS recovery period – Similar to the straight line method over a GDS recovery period, it allows you to deduct the same amount each year except for the year you place the asset in service and the year you dispose of it. In the MACRS Depreciation Methods table you can see what type of property would use this method. No matter which depreciation method is right for your business, you’ll be able to record and track depreciation schedules using QuickBooks Online. New customers can sign up for a free trial or get up to 50% off the purchase of QuickBooks Online. Now that you have a better understanding of how to determine the depreciation system, property classification, recovery period (useful life), depreciation method, and convention, let’s take a look at a few examples on how to calculate depreciation for fixed assets using the MACRS method. Let’s say you purchased a machine, some furniture, and a computer. Based on the Depreciation Recovery Period table, the machines and furniture have a recovery period of 7 years, and the computer has a 5 year recovery period. To determine the depreciation method to use, refer to the Depreciation Methods table. All 3 assets are considered to be “nonfarm” 5 and 7 year properties, so we will use the GDS using 200% DB method. To determine the depreciation rate table to use for each asset, refer to the MACRS Percentage Table Guide. All 3 assets will use Table A-1. The machine is a 7 year property that was placed into service in the first quarter of the year (Jan). It does not qualify for the mid-month convention because it is not nonresidential real property, residential real property, or a railroad grading or tunnel bore. It does not qualify for the mid-quarter convention because there was no property purchased in the last quarter of the year. Therefore, we will use the half-year convention which means that depreciation expense for the first year and the year the machine is disposed of will be calculated at 6 months regardless when the machine was placed into service. Using the rates from Table A-1 for 7 year property gives us a depreciation rate of 14.29% for year 1 for the machine. The furniture is 7 year property that was placed into service in the second quarter of the year (April). It does not qualify for the mid-month convention because it is not nonresidential real property, residential real property or a railroad grading or tunnel bore. It does not qualify for the mid-quarter convention because there was no property purchased in the last quarter of the year. Therefore, we will use the half-year convention which means that depreciation expense for the first year and the year the furniture is disposed of will be calculated at 6 months regardless when the furniture was placed into service. Using the rates from Table A-1 for 7 year property gives us a depreciation rate of 14.29% for year 1 for the furniture. The computer is 5 year property that was placed into service in the third quarter of the year (Sept). It does not qualify for the mid-month convention because it is not nonresidential real property, residential real property or a railroad grading or tunnel bore. It does not qualify for the mid-quarter convention because there was no property purchased in the last quarter of the year. Therefore, we will use the half-year convention which means that depreciation expense for the first year and the year the computer is disposed of will be calculated at 6 months regardless when the computer was placed into service. Using the rates from Table A-1 for 5 year property gives us a depreciation rate of 20.00% for year 1 for the furniture. For tax purposes, you must complete Form 4562 to calculate your allowable depreciation deduction. The IRS has provided a MACRS Worksheet on page 40 of Pub 946 to help you calculate this deduction so that you can easily transfer the info to Form 4562. If you’re using a tax software like TurboTax, filling out this form will be a normal part of this process and you don’t need to worry about filling out additional forms. As with all tax deductions, you need to keep good accurate records that support your tax deductions. This includes any contracts, title documents and all receipts. You will also need to create and save a depreciation schedule for all fixed assets. Calculating depreciation can be a tricky business. For some business owners, depreciation calculations will come naturally. But if you still feel a little lost, you’re not alone. For many business owners, it makes sense to just trust a professional accountant to take care of depreciation and other small business bookkeeping needs. If you need a bookkeeper to help with depreciation schedules and other bookkeeping needs, we recommend Bench. The experts at Bench will keep track of your books and coordinate directly with your CPA/Tax accountant to provide them with the info they need to file your tax return without bothering you. Plans start at $95 per month and you can get a free trial consultation (and a free set of financial statements for your business). What method should I use for a boat trailer, valued $1500.00 ? Would it be ok to expense it or use 179? I am depreciating a fishing boat ,valued $44,000 for 7years. Years 1-4 is DB and 5-8 is SL. The boat and trailer were put into service October 2017. Calculating depreciation can be a tricky business...Use this guide to make it easy.